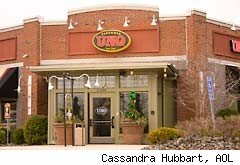 Massachusetts-based Uno Restaurant Holdings Corp., owners of the Pizzeria Uno restaurant chain, filed for Chapter 11 bankruptcy protection Wednesday. As part of its restructuring, the company has agreed to convert $142 million in senior secured debt into a 96% equity stake in the company, giving it what Uno's website refers to as the "resources to invest in its growth opportunities. "While this may sound like good news to fans of the chain, the truth is a bit more complex: Based on recent expansion moves, it looks like further growth will not improve the quality of the pizza. When Uno emerges from bankruptcy court protection in 90 to 120 days, its financial future looks optimistic. It has reached an agreement with bondholders and is seeking court approval for $52 million in debtor-in-possession financing from Wells Fargo (WFC). While it claims that lowered discretionary spending and higher commodity costs resulted in a 2009 loss of $22.2 million, the company still had impressive revenues of more than $286 million. At the same time, Uno also launched a massive expansion late last year. In fact, part of Uno's $142 million debt is attributable to its bright prospects: In 2005, an investment firm, Centre Partners Management LLC, assumed the debt as part of a plan to consolidate ownership of the company. Under the bankruptcy, however, Centre Partners' interest in the chain will be eliminated, as will Uno Chairman Aaron Spencer's part ownership. One big question is how the Uno bankruptcy will affect the pizza. After all, "restructuring" and "expansion" often go hand-in-hand with cheaper ingredients and lowered standards. Chicagoans, who tend to be rabid in their support of the brand, don't have anything to worry about: When Florence Sewell, wife of the original owner, sold the chain in 1992, the buyers had to agree that they would not change the pizza at the original four Chicago locations. For the rest of us, however, the future doesn't look quite so yummy. Last November, Uno announced plans to open more than 160 locations of its Uno Express fast-food chain, even as it closed 16 of its full-service restaurants. Offering what the company calls a "quick-serve concept" with a "flexible menu at a low cost of entry," the Express outlets extend the company's brand, which also includes the more upscale Uno Chicago Grills, "fast-casual" Uno Due Go outlets, and a line of Uno frozen foods. For stockholders, Uno Express is a positive development, as the outlets have lower labor costs, fewer options, and more mass production. Perhaps best of all, they can be wedged into much smaller spots, allowing Uno to cram its pizza into more airports, sporting arenas and other areas where space is at a premium and the customers aren't too demanding. Unfortunately, Uno Express and the chain's other new options represent, at best, a dilution of the brand. Through them, the company is offering fewer options, and its finished products are getting further and further from the kitchen that produced them. At worst, Express is a sort of Sbarro-ification, in which a company that built its brand by offering reasonably priced, high-quality pizza, increases its bottom line by dropping standards. In the end, while Uno's bankruptcy and restructuring may clear the road for further expansion, it may prove the brand's undoing, especially if it sacrifices high quality for a large footprint.